For billions of us, Google is an everyday part of our lives. We depend on it for searching, e-mail, shopping, evaluating businesses, networking with others, finding our way around, and a host of other daily routines.These conveniences are too good to resist, but with these conveniences comes a loss of personal privacy. A company can glean a lot of valuable information about an individual by tracking only their location, and in turn this information can ultimately be translated into company revenue. In this process however, others might also gain access to this information. Though you might already know how Google collects and uses information about you, we sometimes need to be reminded as to how this information is being made available to us, so we can reveal the potential for others to gain access to it through vectors such as shared devices, and remembered passwords. 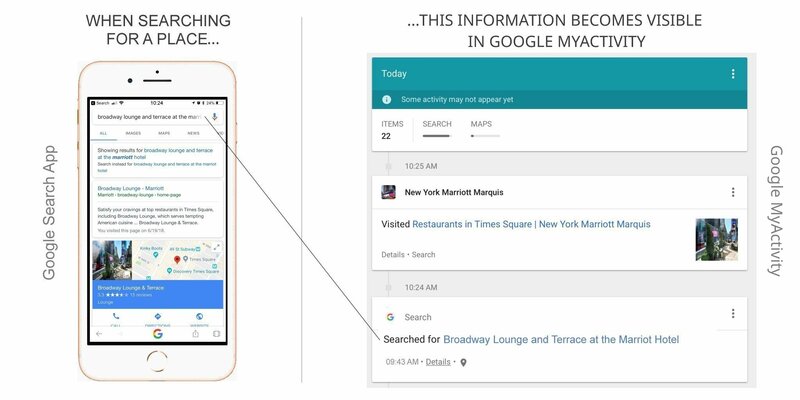 Based on how much you use Google, it's possible for others to monitor your current location from other devices that you have used previously. In this article, we'll discuss some of many ways that you can unwittingly reveal your location to others by using Google services, along with proactive and ongoing precautions you can take to prevent this from happening. E-mail - You have several e-mail accounts. One or more of them is a Gmail account. When you sign into your Gmail account, you are effectively signed in to a host of other Google services, including Search and Maps. At some point in time, you have signed into these Gmail accounts from each of your devices to check your e-mail. Devices - You have 3 or more devices that you use regularly. For example, your notebook from work, your smartphone, and a tablet. Some may not actually be owned by you, such as your notebook. One or more of your devices is left signed in to Google, or you have accidentally or intentionally selected to remember your password to make it easier to sign in on these devices. Accounts - You might keep some of your devices secured with an account name/password. For "single user" devices like tablets or smartphones, you might use a passcode, touch ID, or face ID. You might use devices that you share with other people, and are more likely to leave these unattended. These shared devices might not have any access protection, or you might have shared passcodes, touch ID's or face ID's. Apps - You use one or more Google Apps on one or more of your devices, such as Gmail, Google Maps, or Google Search. Routine - When you leave your home, for instance to go to work or travel, you might tend to leave at least one of your devices behind - for instance leaving a tablet, or a PC at home or at work. Based on this, we'll assume someone else might have access one of these devices when it is left unattended. Perpetrator - When talking about who might have access to your location, we'll focus on other entities (people, organizations, companies, nation states, etc...), not Google. While using Gmail and the Gmail App, clicking on a link will record this information to your Google account, making it visible to others who might have access to your Google account from other devices. 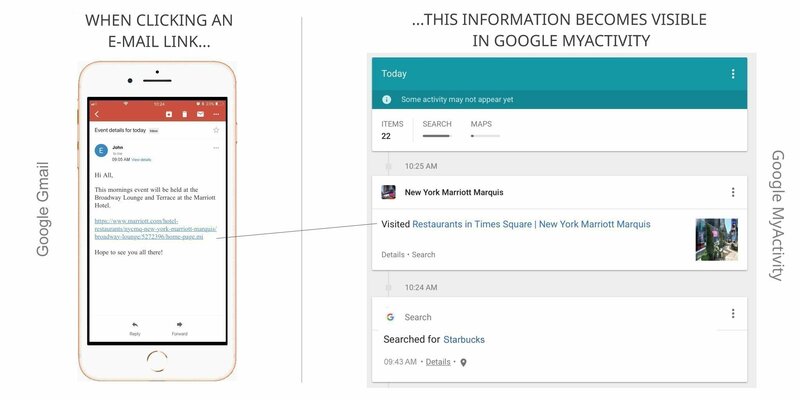 Every search that you make using Google Search and the Google Search App is recorded, and can be viewed in realtime by others who might have access to your Google account from other devices. The Google searches you make can go a long way to revealing your current and intended locations, as shown below. In addition, Google Search records your physical location. 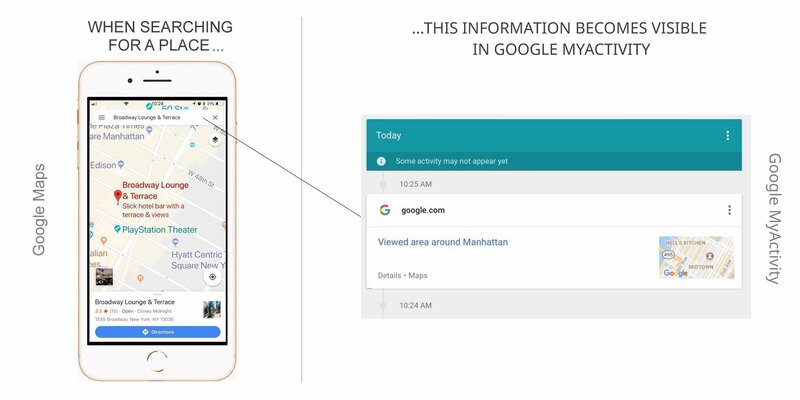 While signed into Google Maps and the Google Maps App, every search you make is recorded by Google, and can be viewed in realtime by others who might have access to your Google account from other devices, as shown below. 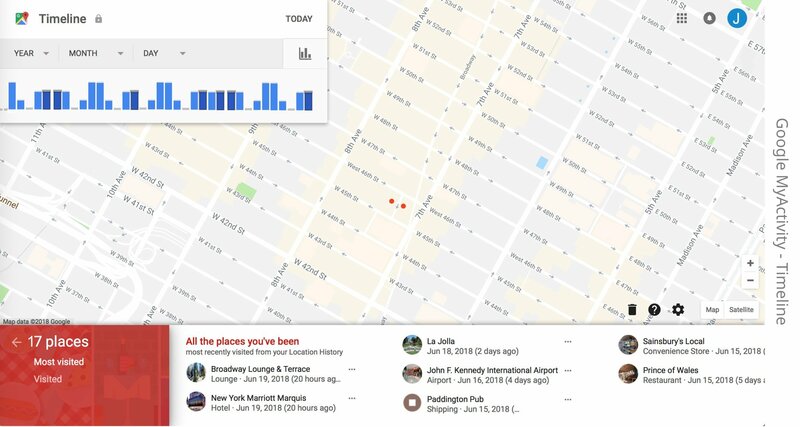 While signed into Google Maps and Google Search, your current location and location history is recorded by Google, and can be viewed in realtime by others who might have access to your Google account from other devices, as shown below. When signing into a new device, or a device which has recently had it's browsing information cleared, Google will normally issue a notification to other devices that are signed in to the same account. Within this e-mail notification, your location, device type and IP address are disclosed. 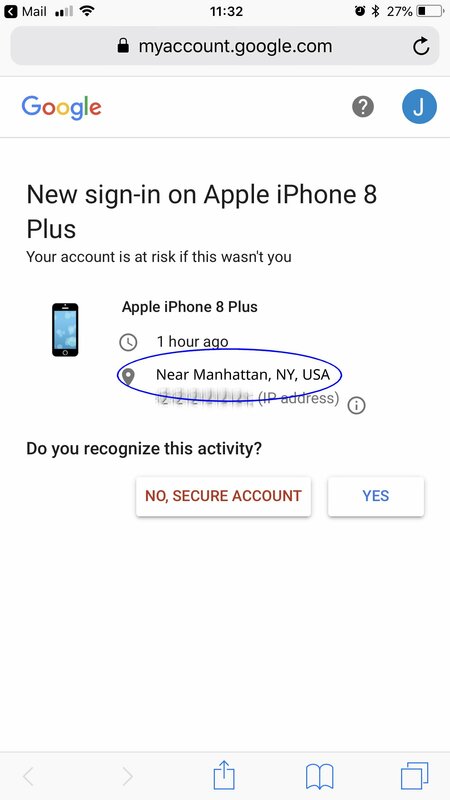 While this type of notification is helpful for determining unauthorized access to your account, in legitimate circumstances, it can also divulge your current location to others who are using a device that is signed in as you. Perform these steps to prevent Google collecting, storing and dispersing information about your activities. 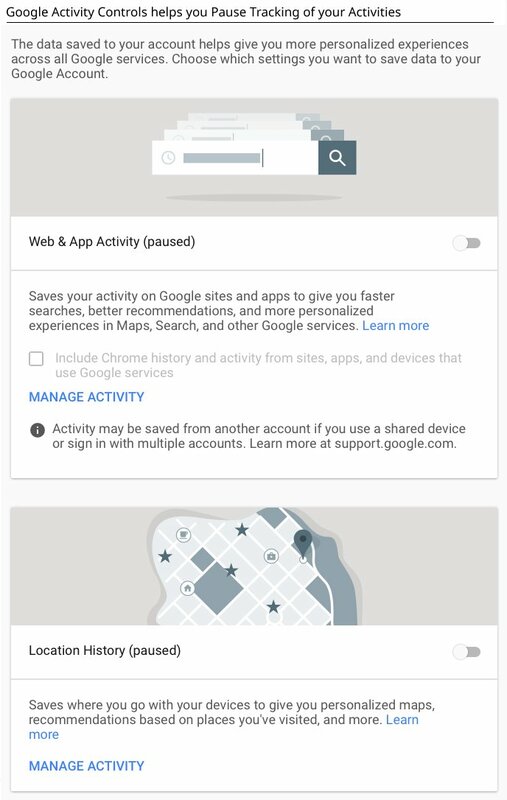 Turn off Google Tracking Settings - On a tablet, notebook or PC, sign in to Google MyActivity. Under My Activity, Activity Controls you can "pause" collection of your web/app activity using the Web and App Activity option, and you can "pause" the history of your physical location via the Location History option. Under My Activity, select the "Delete activity by" option to clean up past activity. Enable two-factor authentication (2FA) - Enable 2-Step Verification on your Google account to require an additional verification step, before allowing access to your Google account. Change your Password Regularly - Regularly change your password, and make sure to store it in a safe place. Review password guidelines. Always Sign Out after using Google - Signing out of Google Apps, such as Chrome, Google Search, and Google Maps will help to prevent others from viewing the links that you have opened, the searches you have performed, and the locations that you have visited. Be Careful about Remembering Passwords on Devices - When prompted to remember a password, try to keep in mind that, depending on the device and operating system version, along with the changes that each version brings to it's user interface, it can be time consuming to drop everything and try to find the option to forget this remembered password. Review your Stored Passwords Regularly - Regardless of whether you think you are logged out, or have a stored password on a device, it always pays to regularly review your stored passwords. Know Who Else has Access - Be aware of all other devices that you might have used in the past, or use regularly to access your account, along with who else might have access to the device to sign-in to your Google account - especially when you are not physically present. Use Google Privacy Tools - To build your understanding of how Google collects, uses and discloses your personal information, you should regularly visit the Google Privacy Tools to review Privacy settings on your account. Take care not to depend on these tools holistically. Always perform the above basic checks yourself. In this article, we have covered some ways that your location can be revealed without your knowledge, simply by using Google Apps and Services, along with some steps you can take to mitigate the ongoing collection of this information. Technologies such as blockchain can help us to better control where our information is released to, and how it will be used in the future, as discussed in this article by Sarah Rothrie originally posted on CoinCentral.com. 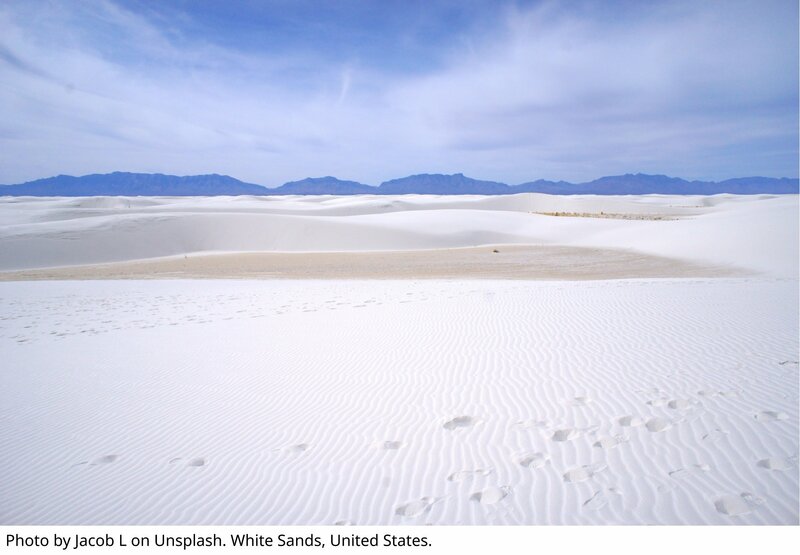 White Sands, United States: Photo by Jacob L on Unsplash.